The brother of Lieutenant General Philip Henry Sheridan, he was born in Somerset, Ohio, May 24, 1840. He attended St. Joseph's College, Somerset. During the Civil War he served as a volunteer aide to his brother at the battles of Perryville, Kentucky, and Stones River, Tennessee, October 1862 to January 1863. Appointed First Lieutenant, 2nd Missouri Volunteer Infantry, September 7, 1863. Then served as Captain, Aide-de-Camp, May 18, 1864 to the end of the war on his brother's staff. He was honorably discharged on August 1, 1866 and breveted Brigadier General, United States Volunteers, for his war service. From 1870 to 1878 he served as a Lieutenant Colonel on his brother's staff and in the Department of the Platte from 1889 to 1893. Appointed Assistant Adjutant General, Department of the Missouri, where he served from 1897 to 1908. Then as Adjutant General of Volunteers at Camp Thomas, Georgia, from 1899 to 1900. He died, age 78, in Washington, DC, on February 21, 1918 and is buried in Section 2 (in the Sheridan Plot) at Arlington National Cemetery. On detached service as Aide-de-Camp to the Lieutenant General of the Army. Born in Ohio, May 24, 1840 and entered military service from there as a volunteer Aide-de-Camp to Brigadier General Philip Sheridan (his brother) from July 1, 1862 to September 7, 1863. Appointed Second Lieutenant, 2nd Missouri Volunteers, from September 7, 1863 to June 28, 1864. On June 29, 1864, accepted appointment as Captain, ADC of Volunteers to date from May 18, 1864, and served on Major General Sheridan's staff until August 1, 1866. He participated in numerous engagements during the Civil War. After the surrender of Lee's Army of Northern Virginia at Appomattox Court House on April 9, 1865, he was transferred to the Department of the Gulf where he served until August 1, 1866, when he was mustered out of the volunteer service. He received appointment as Second Lieutenant, 5th US Cavalry, from February 23, 1866, until he received a commission as Captain, 7th US Cavalry, to rank from July 28, 1866. 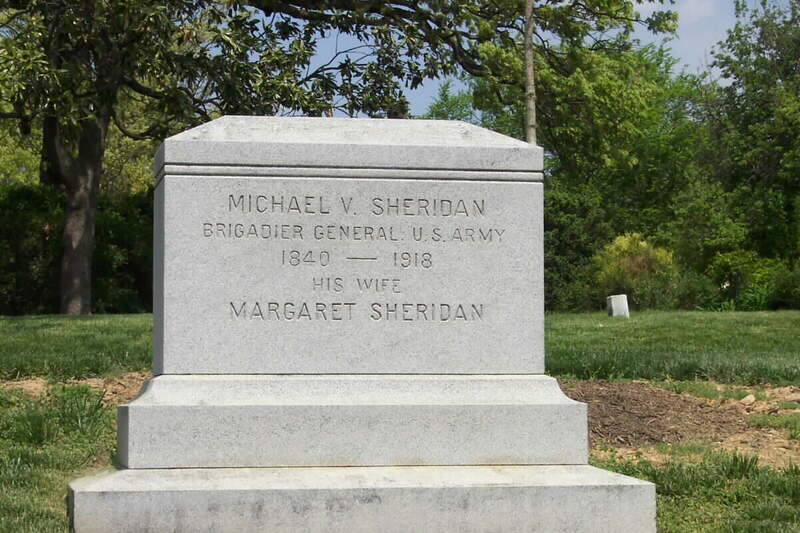 He served with that regiment until July 1, 1867, when he was appointed ADC to Major General Sheridan and served in that position for many years. Appointed ADC, with the rank of Lieutenant Colonel, on August 1, 1870, and Military Secretary to General Sheridan from April 9, 1878 to June 1, 1888. He was Colonel, ADC, to General Sheridan from June 1 to August 5, 1888; Lieutenant Colonel, AAG, to July 9, 1892, and Colonel, to January 1897. Appointed Brigadier General of Volunteers on May 27, 1898, and honorably discharged from volunteer service on May 12, 1899. Promoted to Brigadier General, US Army, on April 15, 1902, and retired on April 16, 1902. Died February 21, 1918, at Washington, D.C.
Born at Somerset, Ohio, May 24, 1840, the youngest brother of Philip Henry Sheridan. Attended St Joseph's College, Somerset, Ohio. He was a volunteer aide to his brother at the battles of Perryville, Kentucky, and Stones River, Tennessee, October 1862-January 1863; appointed First Lieutenant, 2nd Missouri Infantry, September 7, 1863; Captain, Aide de-Camp, May 18, 1864; honorably mustered out of Volunteer service, August 1, 1866. Appointed Second Lieutenant, 5th U.S. Cavalry, February 23, 1866; Captain, 7th U.S. Cavalry, July 28, 1866; Major, Assistant Adjutant General, June 7, 1883; Lieutenant Colonel, July 29, 1892; Colonel, January 25, 1897; Brigadier General of Volunteers, May 27, 1898; honorably discharged from Volunteers, May 12, 1899; Brigadier General, U.S. Army, April 15, 1902; retired at his own request, with over 30 years of service, April 16, 1902. Breveted Major, U.S. Volunteers, March 13, 1865 "gallant and meritorious services"; Major, March 2, 1867 for the battle of Opequan, Virginia; Lieutenant Colonel, March 2, 1867, for the battle of Fisher's Hill, Virginia. Took part in battles of Chickamauga, Missionary Ridge, in Grant's campaign around Richmond, in Shenandoah, Appomattox campaigns. Lieutenant Colonel and Aide-de-Camp to his brother, 1870-78, and his military aide, 1878-88; Adjutant General of the Department of the Platte, 1889-93; Assistant Adjutant General, Department of he Missouri, 1897-1908; Adjutant General of Volunteers at Camp Thomas, Georgia, April-July 1898; Chief of Staff to General Brooke in the Puerto Rican expedition, July-December 1898; commanded the Department of the Lakes, 1898-99; Adjutant General of same, 1899-1900, Department of the East, 1900-02. He died on February 21, 1918 at Washington, D.C. Buried in Section 2, Grave 905, Arlington National Cemetery.